Last weekend I found some time to squeak in a quick little makeover project that my wife has been anxious for me to do for a while now. 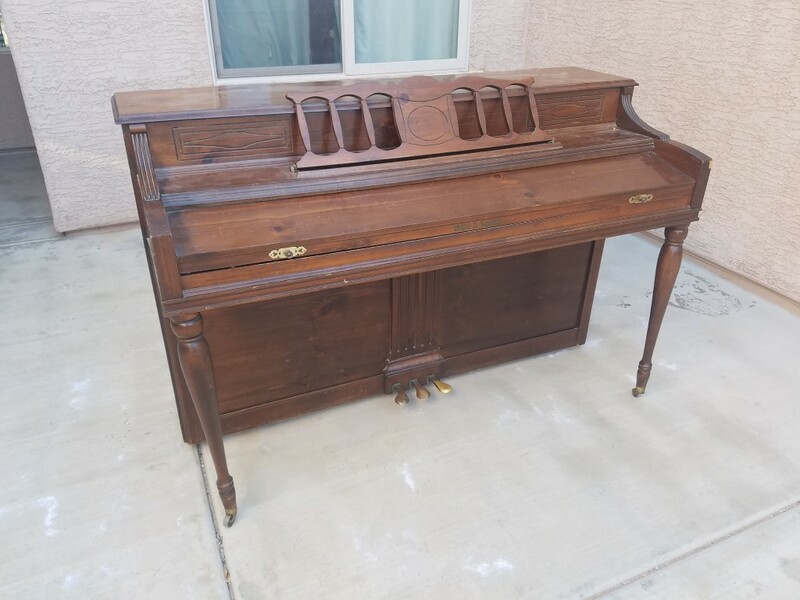 I’ll admit it, painting a beautifully-stained, vintage-style, classic Kohler & Campbell piano felt just a little bit wrong. How could anyone take something so original, so natural, probably hand-stained by some really old guy, and just slap a dull, ordinary coat of paint on it? I’m glad you asked, because I’m going to show you just how I did it! First things first, Pinterest. There’s no shortage of painted pianos out there to get some ideas from. Everybody who’s painted a piano has a slightly different approach to it and it helps to see what’s out there. For purposes that suited me, I chose one of the simpler methods in terms of complexity. Though the results surpassed my expectations. Color options range from white, to off-white, teal, baby blue, green, gray and black and I even saw a few red pianos out there for the truly bold. In my case the color choice came down to the paint type I wanted to use. The wife wanted a classic gray and I agreed. So gray it was. Now, if you’re willing to buy wall/house paint (such as the Behr brand from The Home Depot) you can pretty much pick the color of your choice. 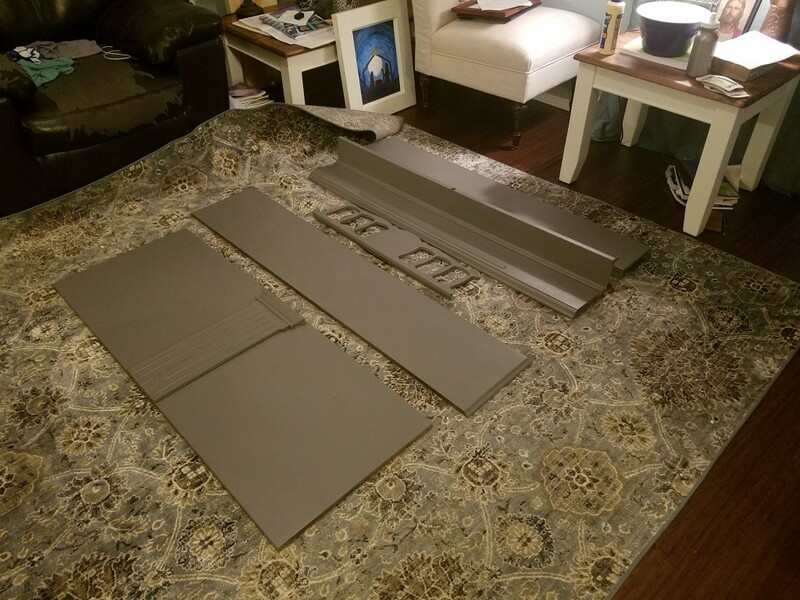 I’ve had decent success using Behr paint to paint furniture (and speakers). I’ve painted with brushes (tends to leaves brush strokes). I’ve painted with rollers (looks good but takes A LONG time). And I’ve painted with an HPLV sprayer (Wagner) though the finish has that “sprayed” look to it, it’s not as smooth as the other two options but is quick and the coverage is high considering the cost. This has just been my experience though and I am in no means an expert in painting techniques. But there was always one paint type I avoided like the plague when painting furniture and that was good old fashioned spray paint. I always discounted spray paint as a legitimate painting medium because to me anything sprayed with spray paint looked just like that, like it was spray painted. Spray paint was reserved for those cheap projects, like a pinewood derby car, or a homemade set of roof racks for the car, or for people on HGTV who are trying to take junk from a flea market and sell it for 10 times what they paid to unsuspecting consumers looking for something “different”. So basically anything, almost anything but furniture is where spray paint was best suited. But until recently my opinion of spray paint has done a near 180 and when done right can truly look beautiful, yes, even on furniture. 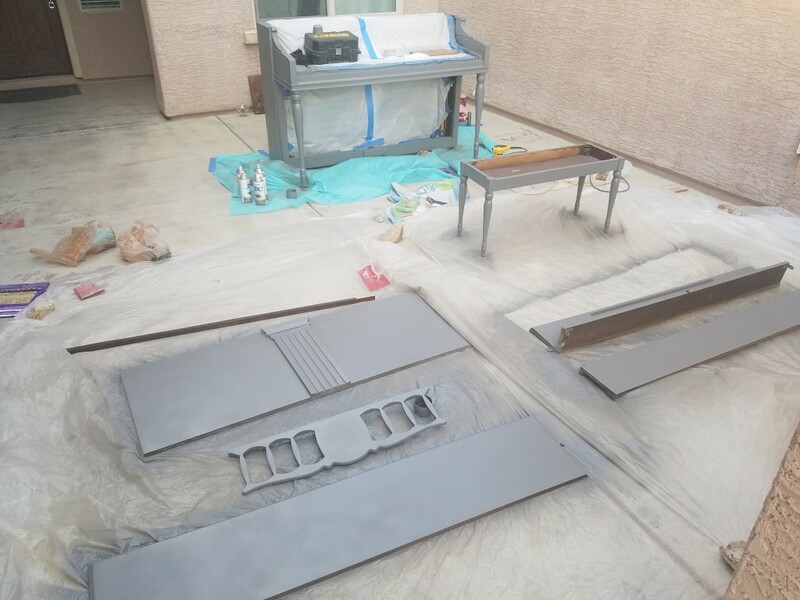 I’d venture to say that spray paint has come along way just in its engineering and chemistry alone in terms of quality, consistency and coverage since the last time I used it. Bare in mind however, not all spray paint is created equally and there is some pretty crappy spray paint out there that can be purchased for very cheap but I would recommend avoiding them or you may end up saying to yourself, yup looks like crappy ole’ spray paint. 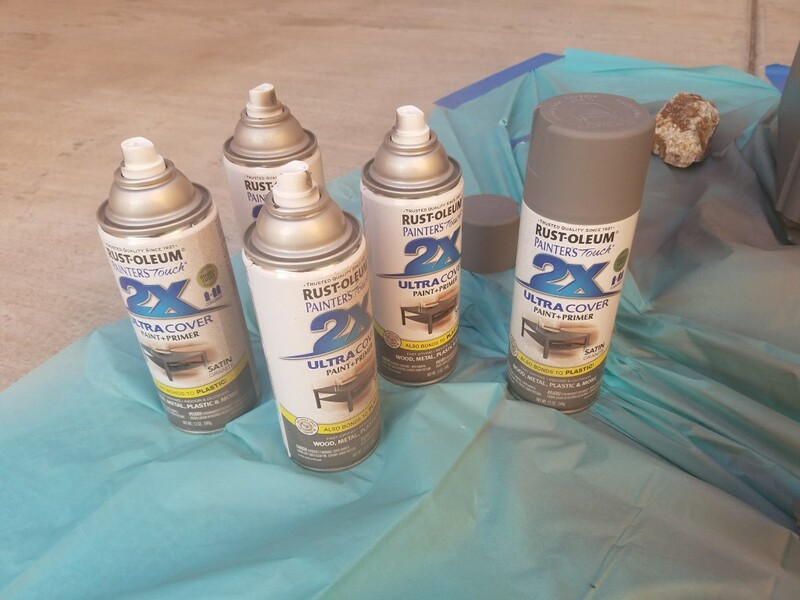 The spray paint I used is Rust-oleum Painter’s Touch 2x Ultra Cover in a Satin Granite (gray). 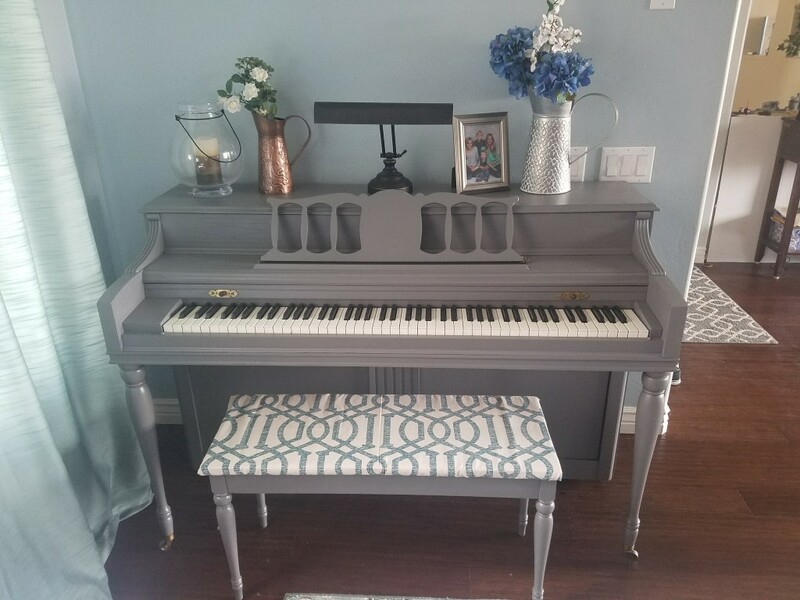 Each can of paint sells for about $3.89 at The Home Depot and for this piano makeover I used just about five cans. But before I get onto the painting details, let’s talk about prep work. 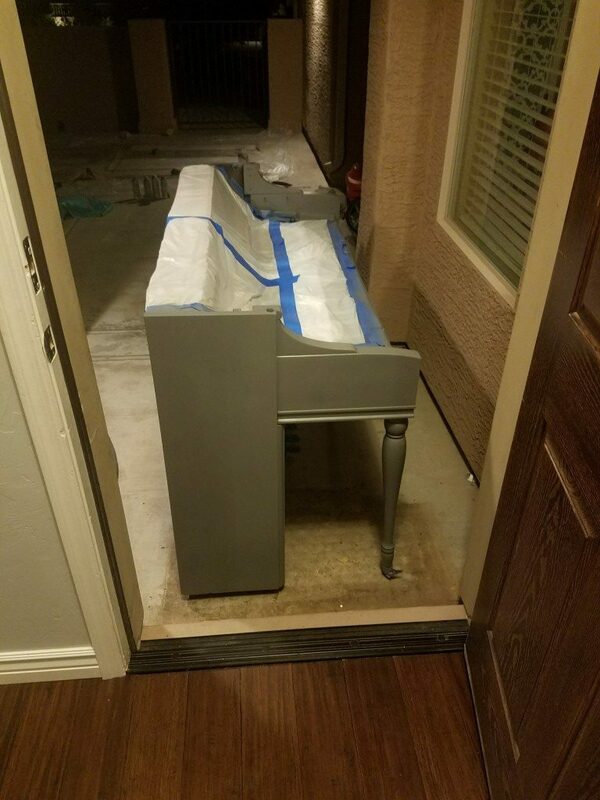 Step one: If you’re going to spray paint your piano, you have to move it out of the house first. This alone is a deal breaker for most people who are looking to paint their old piano if they want to use spray paint. I don’t care how many square yards of 1 mil plastic you have, masking off half you’re living room to spray paint inside the house just seems like a bad idea all around. I had some friends stop by the house to help me move our piano out of the living room and onto the front patio. Took less than 5 minutes with their help. But it’s not a one-man job for sure. 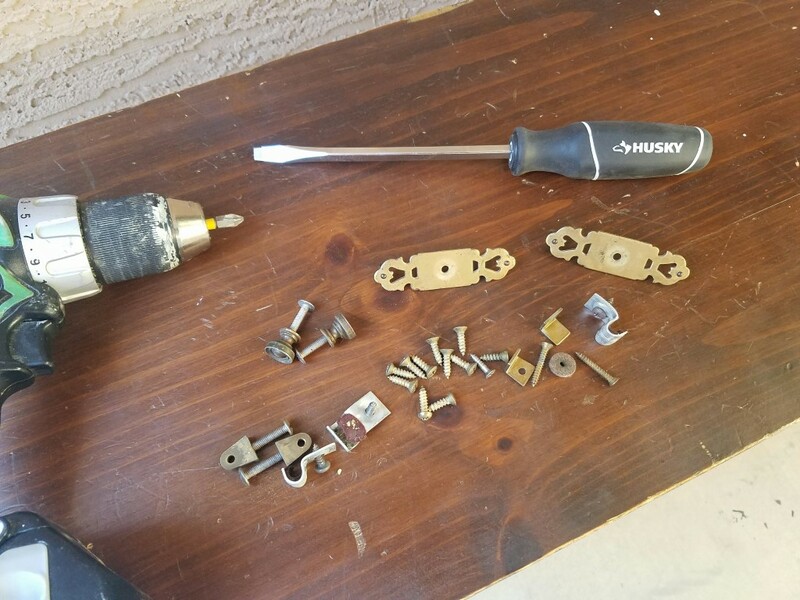 Step two: Once out on the patio I began to disassemble nearly everything on the piano that had screws and could be removed. 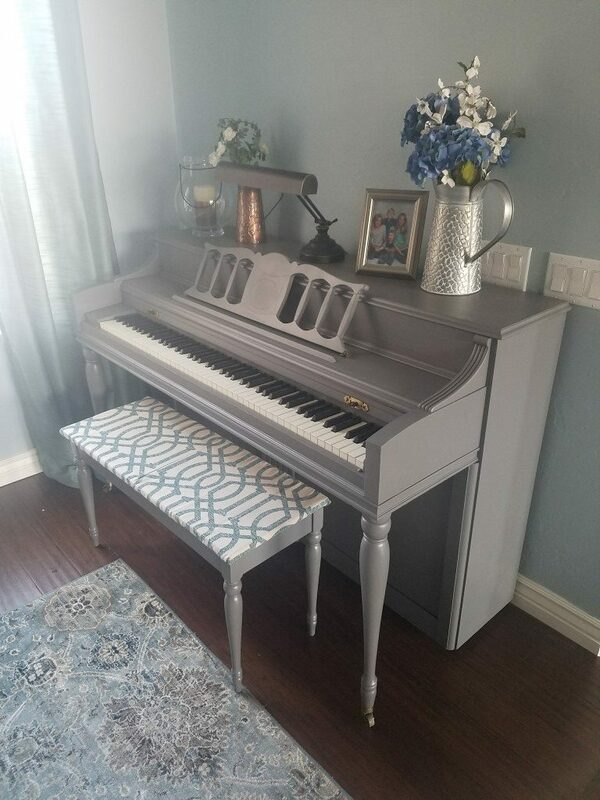 This is the second deal breaker for those looking to paint their piano. It’s just too much work and you risk either breaking something or losing some random piece of hardware or not being able to put everything back together just right. But if you feel inclined and up to the task, I recommend taking off as much hardware as possible and taking off as many pieces as possible and masking off everything else. 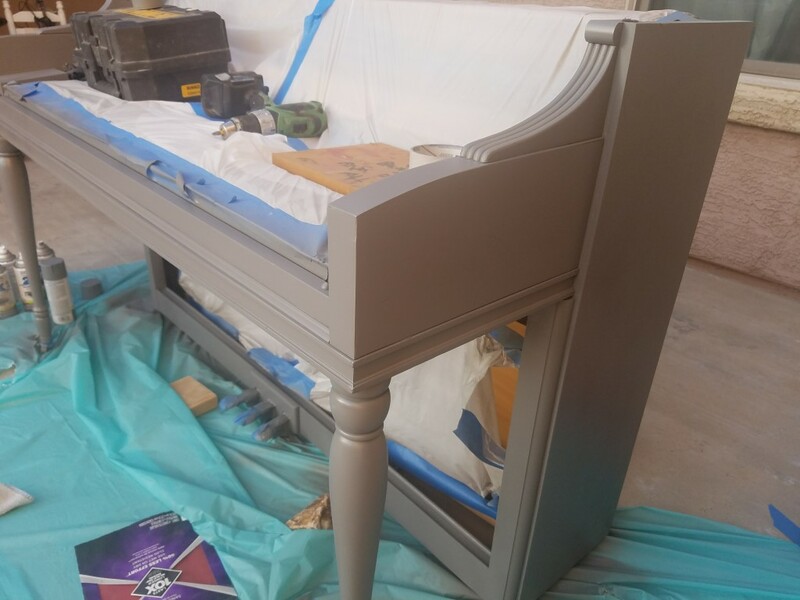 This way each piece is fully painted on all sides so when it’s put back together, you don’t have any seams or cracks or small joints that still show through the original stained wood color. It also makes painting each piece much easier. You can see above all of the pieces I was able to remove and paint. 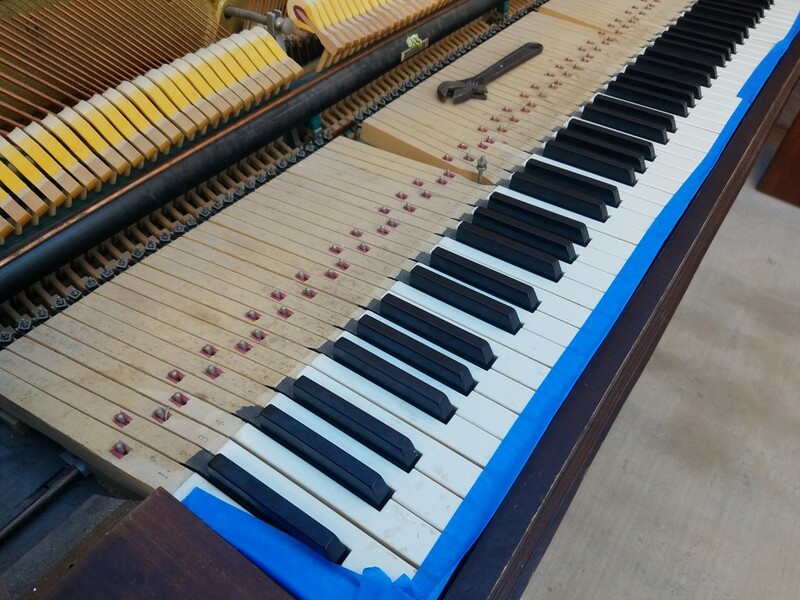 I masked off the keys and the piano strings and hammers with some 1 mil plastic and blue painters tape. I also removed that long skinny piece of wood that sits right over the keys which has the strip of felt on it and painted it separately just so I could mask off the felt and get a good painted edge on the wood that sits right up against the keys. Step three: repair and sanding. 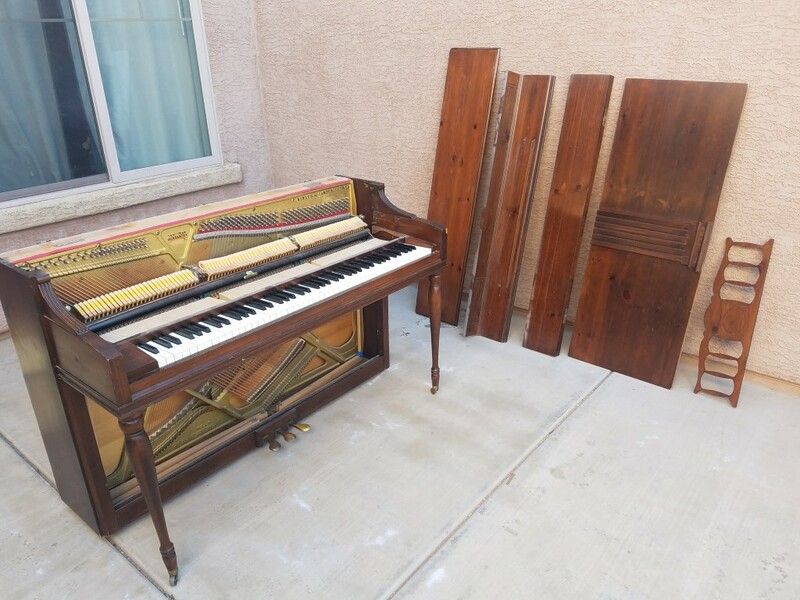 The main reason people don’t feel bad about painting an old piano, and the same reason why I caved as well, is because an old piano is just that, it’s old. The wood is usually damaged in multiple places, the finish has worn and it just doesn’t look as nice as it once did decades ago. This is where the repair part comes into play. 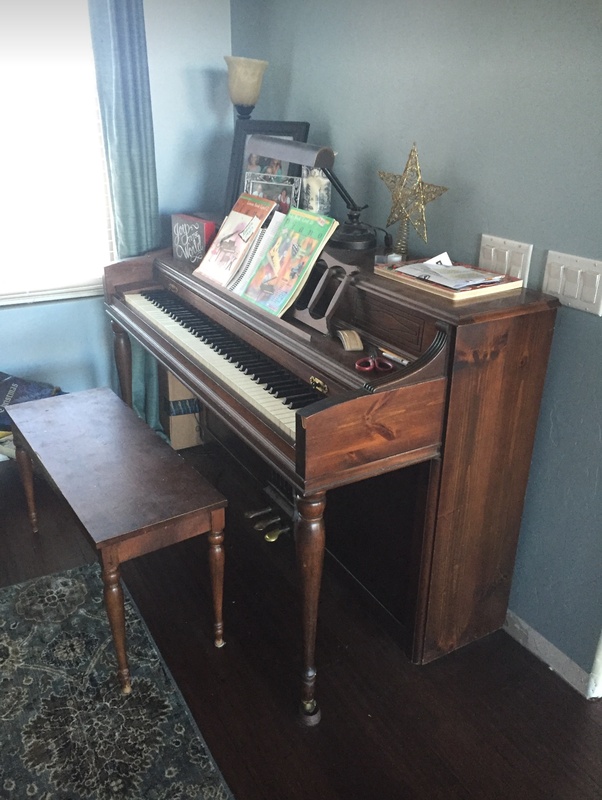 My wife has had this piano in her family for a very long time. This was the same piano she played when she was 8 years old and it’s the same piano my kids play today. So with a little bit of wood putty I went around and filled all the cracks and broken wood parts and then sanded them smooth with 150 then 220 grit sandpaper. 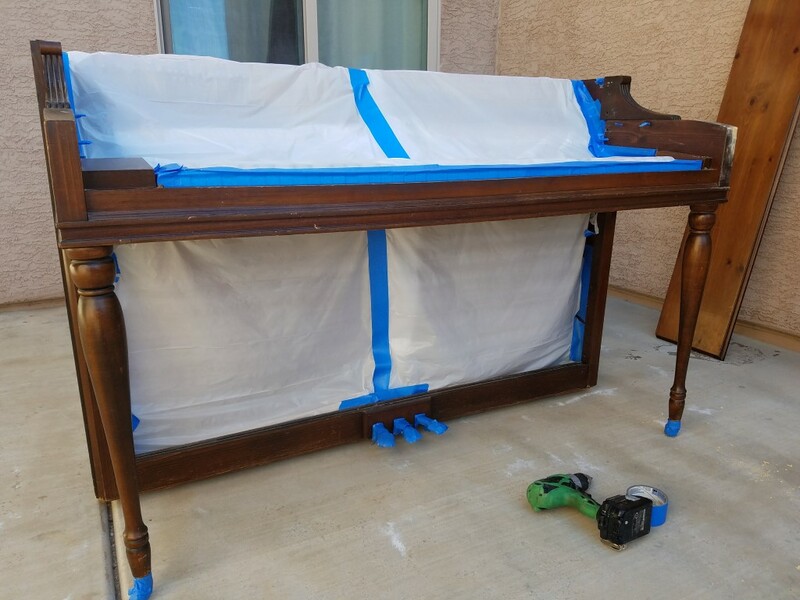 With my palm sander I sanded almost all of the piano with 220 grit sandpaper just to take off the very top layer of clear coat. I was not attempting to remove the clear coat or the stain and never intended on getting down to bare wood. I just went over each piece really quickly to take off the sheen and provide a somewhat roughed up surface for the spray paint to adhere to. This step you could probably skip, however. Depending on the existing finish of your piano. The parts I didn’t sand looked just as good in the end as the parts I did sand, so it probably wouldn’t have made much difference. The overall sheen was a little different in the sanded parts though, it ended up duller than the parts I didn’t sand. Perhaps another downside to the use of spray paint is that the finish ultimately is very dependent on the base finish. Since the paint goes on so thin, most of the underlying texture shows through. 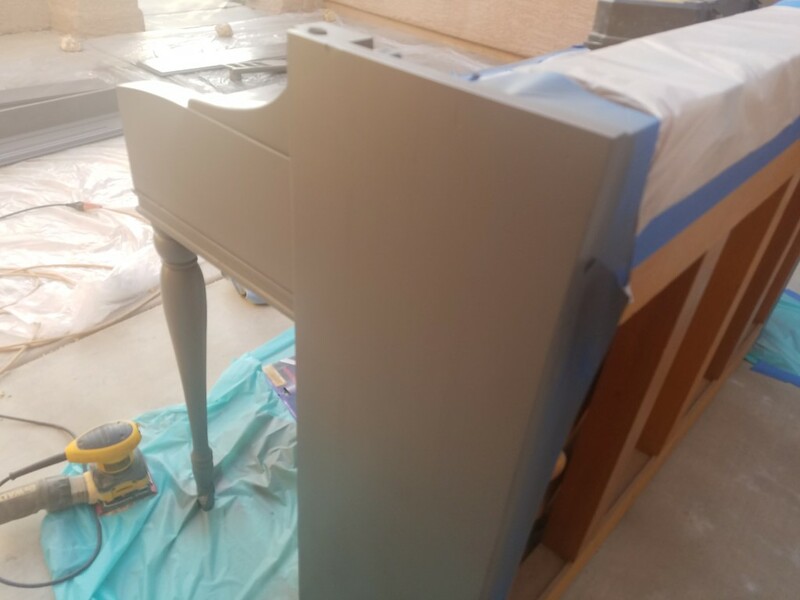 If the piano was really smooth and shiny to start with, then the paint will also go on and look and feel smooth and be shiny. But if it’s rough, the paint does nothing to make look smoother. Additionally the sheen is affected by the undercoat as well. 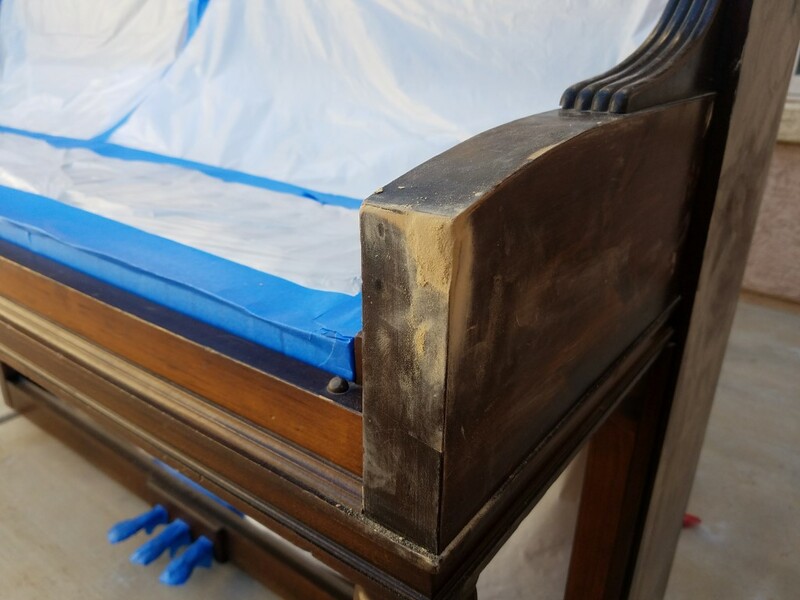 Smoother wood looks shinier than rough wood, regardless of the sheen of paint you’re using. This satin Rust-oleum paint has just enough sheen to look nice without looking dull. But still varied based on quality/texture/ of the base finish. 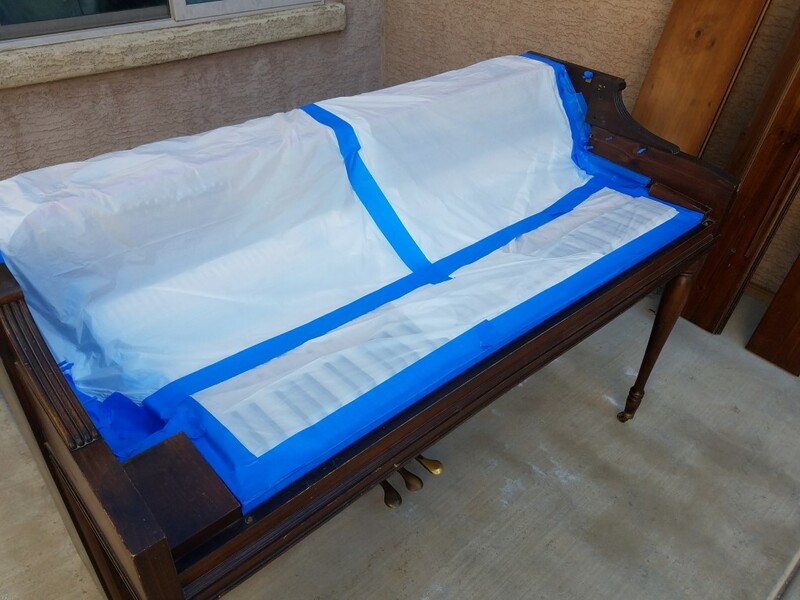 Test out a small section if you’re worried, like under the bench or under the piano top/lid. I painted three light coats one after another all basically within the 1 hour timeframe allowed for re-coats. 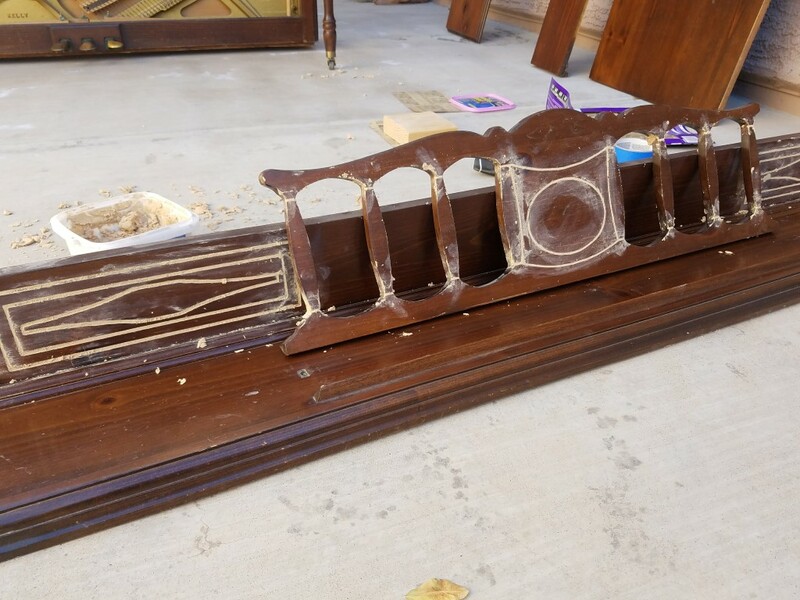 I started on one side and just worked my way around the entire piano and then to each disassembled piece and then started over back at the beginning. The trick, I think, is just not overdoing it in any one spot, allow the first coat to go on and not cover everything. 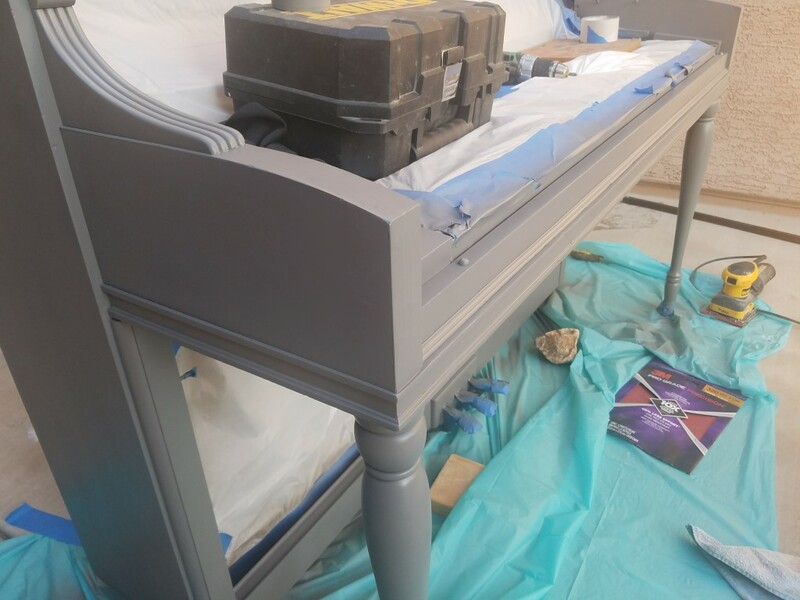 The first coat won’t even look that good and you’ll be cursing yourself for even trying this whole project. But be patient. 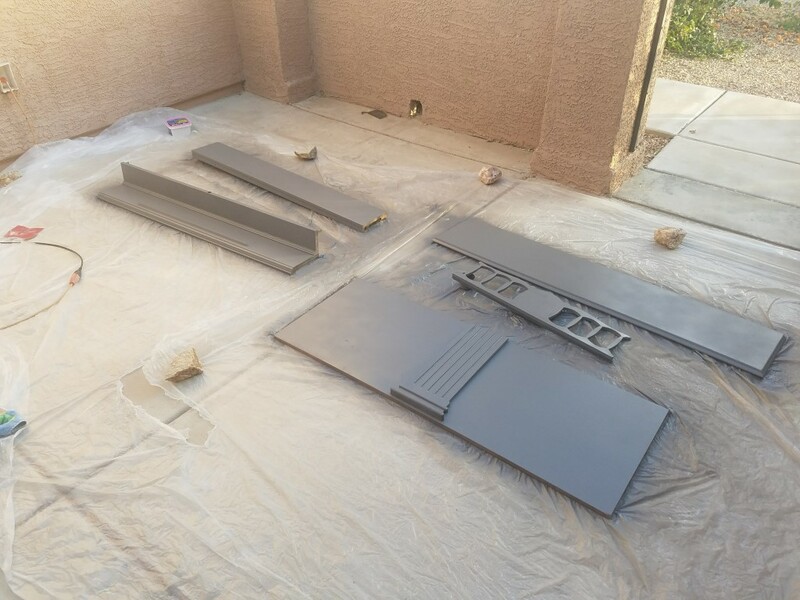 The second coat will fill the gaps once that first coat has had a chance to adhere and dry and by the third coat it will all just look like one seamless band of paint and you’ll be giddy with excitement. Okay so now I’m just describing how it all went down for me. It was panic and fear, then anxious relief and finally awe and bewilderment. 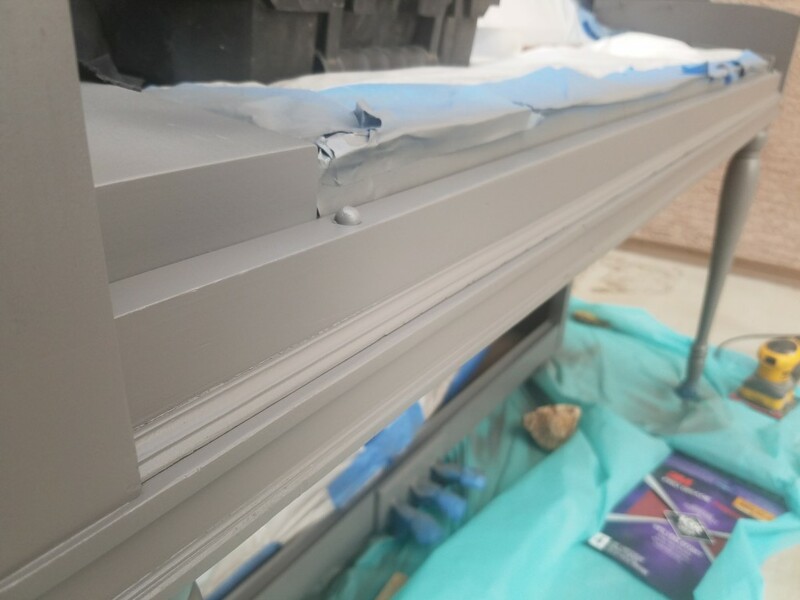 Just take your time, don’t sand between coats, light and easy on the spray nozzle in quick short bursts from 8-12″ away at all times. 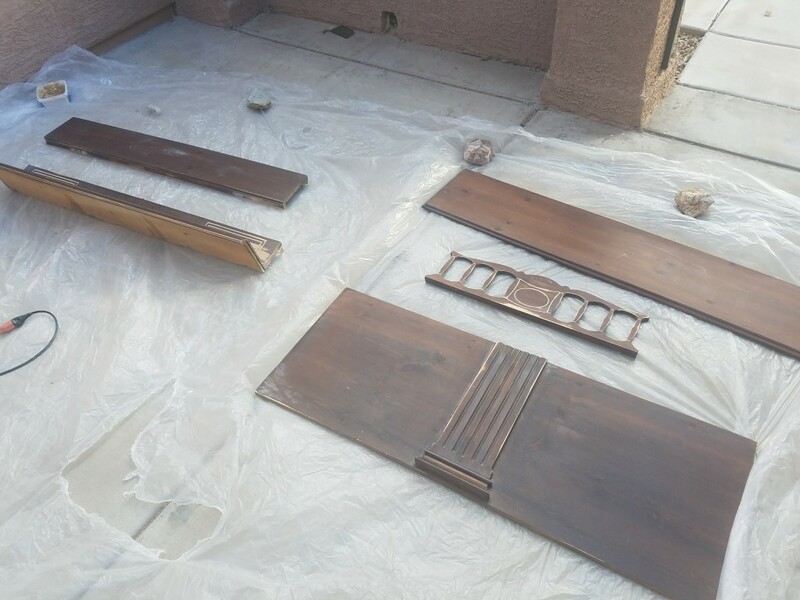 If you do overdo it in a spot or two, let it dry a bit, sand it down lightly, and re-spray. That’s about it, take a step back and check out your wonderful work and don’t forget to snap a few pics for FB/IG. Step four: let dry for 24 hours. I skipped this part and moved the piano back in the house the same day. I let everything dry for only about 4 hours but due to an impending storm I had to get that thing back inside before the rains came (which they did the very next morning). When moving the piano we tried not to handle the painted parts as much as possible, lifting from the back and undersides. But this job can be done in one day if you start early in the morning. I reassembled the piano once in the house and luckily managed to figure out where all the screws went. 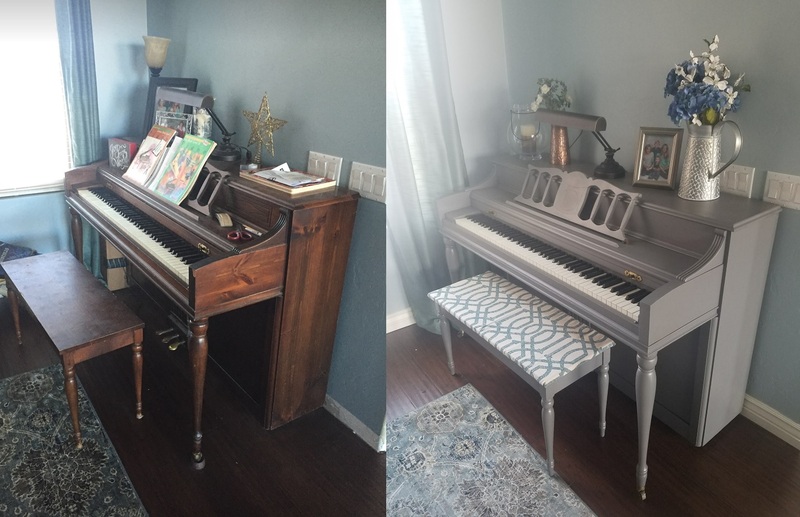 We set the piano up in its new location in the living room and sat back in amazement at the transformation. It looked fantastic. The best that piano has looked in all the years we’ve had it. 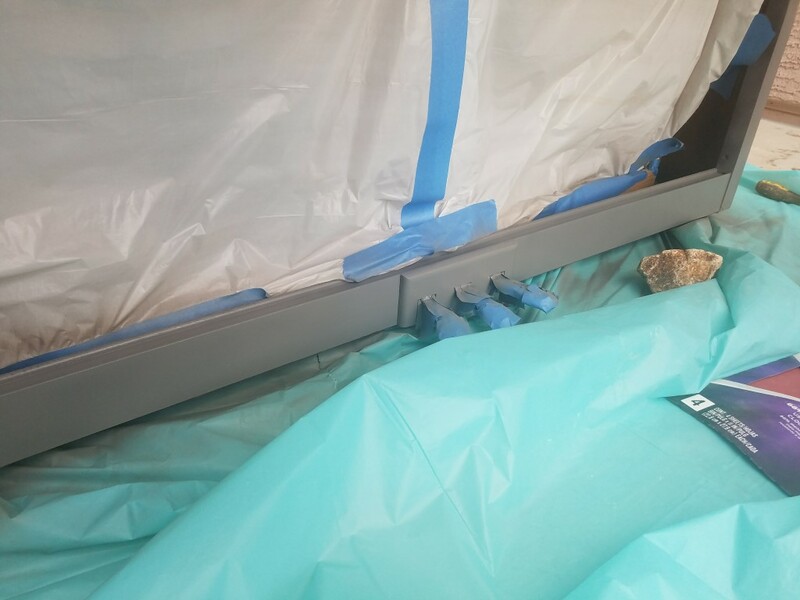 The last thing to do is to finish the fabric bench seat which for now is just a piece of fabric wrapped around the bench lid, but I will get it stapled down with a foam pad on it soon enough. The other thing that we didn’t get to do is put on a couple coats of Minwax Polycrylic satin clear coat. I bought a pint of this stuff expecting to use it but I was so impressed with the final finish of the spray paint that we decided to hold off for now. Now that the piano has been in the house for a few days I have noticed more inconsistencies in the sheen on the sides of the piano and the top. Basically a coat or two of the satin polycrylic will fix that right up. That step can be done anytime with a simple brush while in the house. 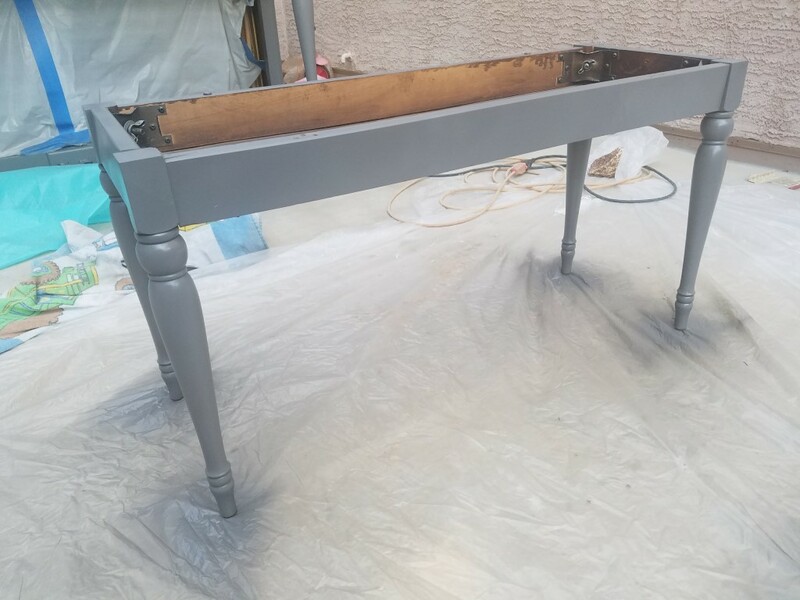 So for another day we may get the final clear coat on this but even if that never happened, I would still be very happy with our new piano and hope to be able to enjoy it years to come. 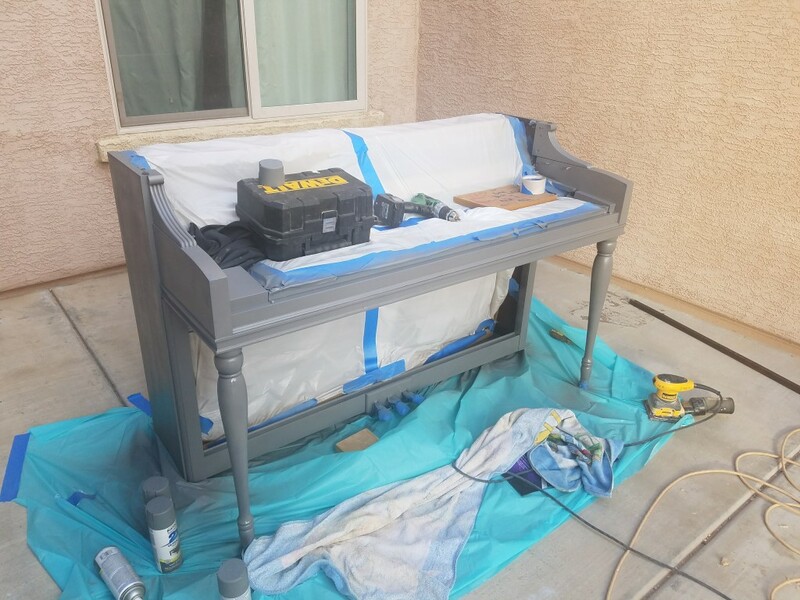 Check out some of pics below of this little painted piano makeover project. Let me know what you think in the comments below and thanks for stopping by! This entry was posted in Home DIY. Bookmark the permalink.